Over the past few months, a few of you might have noticed some HubSpot tracking code on my site. That’s because I’ve been testing HubSpot for today’s post. I use the free version of Mailchimp to manage my email list and have no plans to upgrade. Why? I’m running a lean operation and it’s not large enough to merit the kind of investment your company just made in marketing automation. But the Orange Side does have a ton of wonderful and smart folks like Mike Volpe and Rick Burnes who know how to market. So when I reached out to them last year to ask them about being a great marketer, they asked me to take some time to learn HubSpot instead of just being a fan of their blog. What I learned about the HubSpot system was much more than I anticipated. Here’s an evolution of my thinking about HubSpot, clearly influence by how much I knew each year. So just what is it that HubSpot has that 10,500 firms like? In 2013, why did 5,000+ people show up to Inbound vs. 2,000 at the Marketo Summit? This review will cover HubSpot’s key features. I will naturally make comparisons with Marketo and do my best to be balanced. Because of technical limitations, some features were not fully tested and I will make it clear when I was unable to go through the full system. 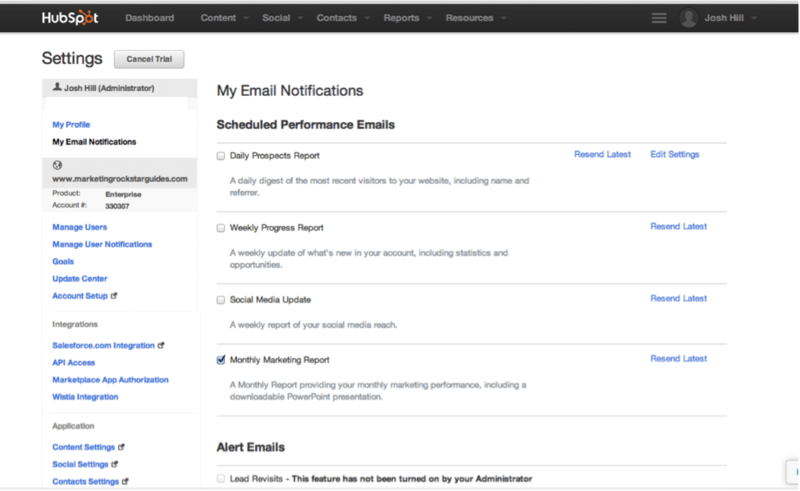 HubSpot is pretty easy to setup. Once you have a login, you are prompted to setup things like the Blog, CNAME, tracking code, and CRM sync. The walkthroughs are good and I did not feel the need to contact Support at this stage. Once your tracking code is live, you can begin using many of the TOFU reports that focus on the website. If you aren’t quite ready to link your blog or go further, you don’t have to do so. 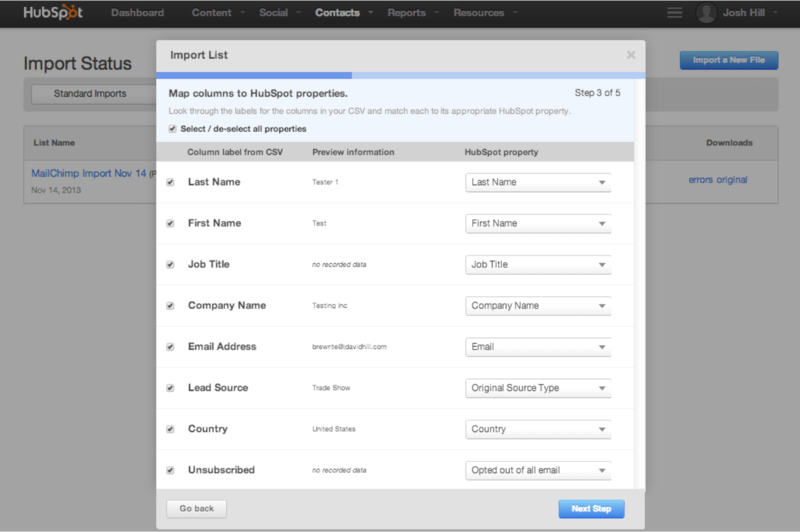 While I did not have a CRM integrated, I was able to import contacts from Mailchimp via CSV file. Importing a list is straightforward. You will need a CSV file and the correct columns. 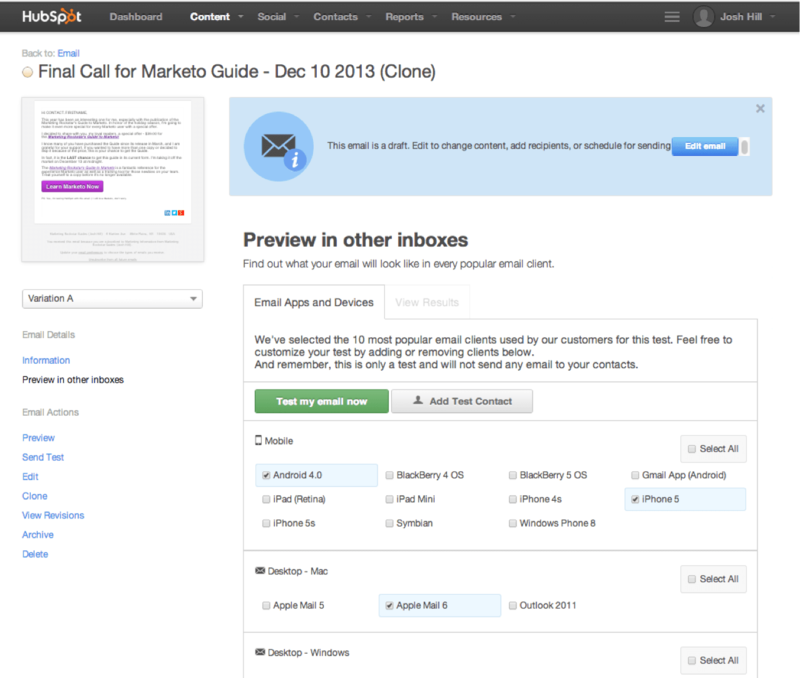 Like Marketo, HubSpot automatically dedupes based on email address. The first time I tried importing in November 2013, this experience was not ideal. For the 200 or so records with 5 fields, this took longer than expected. The system did not refresh the screen or update me the way Marketo or SFDC would. After a few tries, HubSpot finally showed me the list. Rick then showed me their new Import wizard, which I can show you here. It is much faster and much easier to use than the previous system. Prepare your CSV, drop it in, and match the fields and it just works. 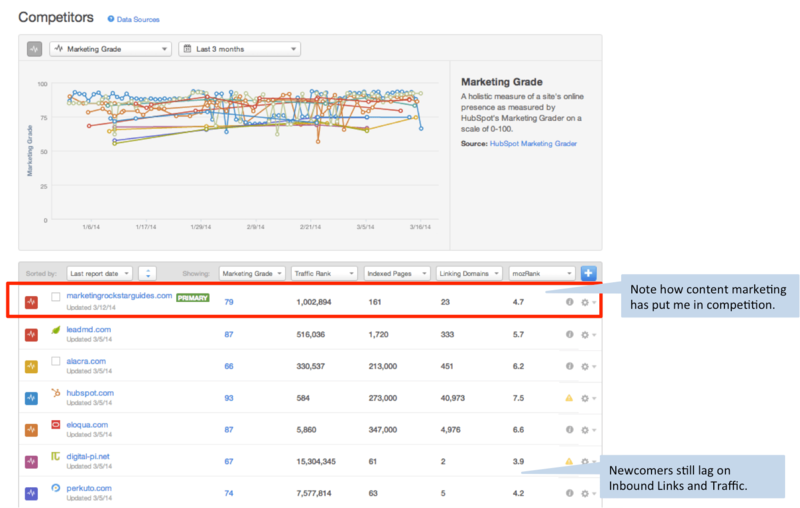 This is a great improvement that shows HubSpot does improve over time like most other software tools. I am still a bit disappointed that the Import wizard wasn’t like this the first time. You do have to be careful with imports because HubSpot strictly adheres to CANSPAM rules. If they find out you lied about your list, you may find your account cancelled. You can upload a suppression list as a separate step, which will block those emails forever. The nice thing is HubSpot saves the original CSV file for future review as well as a list of errors for each lead. Here’s a list of Contacts I imported. HubSpot uses “smart lists” and static lists just like Marketo does. I suppose there isn’t a better name for a dynamic database pull without making it sounds like SQL. The individual record view was much friendlier than other systems. 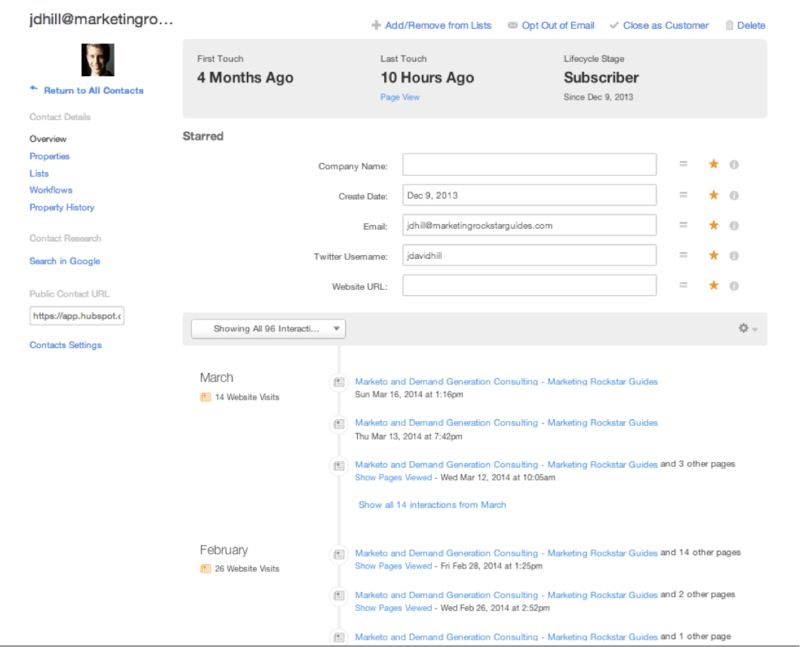 HubSpot shows me a picture of the person, if it can find one, along with the top contact details and lifecycle stage. Scrolling down shows a friendly timeline of interactions by month. The timeline is friendlier than the Lead Activity log in Marketo because it combines “interesting moments” or milestones with direct links to the pages viewed. This type of lead view is probably more helpful for a salesperson than a marketer. HubSpot also offers other event types. Marketers deal with large groups of people, while salespeople work with 1 or 2 people at a time. If that’s not a big hint to Marketo and HubSpot – I don’t know what is. At the same time, having a log in a compact format is helpful for a marketing automation manager who needs to filter through and see step-by-step changes in the record. Yes, you can filter interactions, however, a change log to data is not as easy to get to. Click the “i” icon to see if a field changed at some point. There is also a “Property History” view to see field change logs. I am not a fan of the term “property” for a data field. I know HubSpot must have thought it was friendlier to non-techies, but the term is a bit confusing to me coming from other systems. I like the single page view of all fields for a contact. Editing a record in Marketo can sometimes get confusing if you aren’t sure where a field is – Custom, Standard, SFDC, or Marketo. 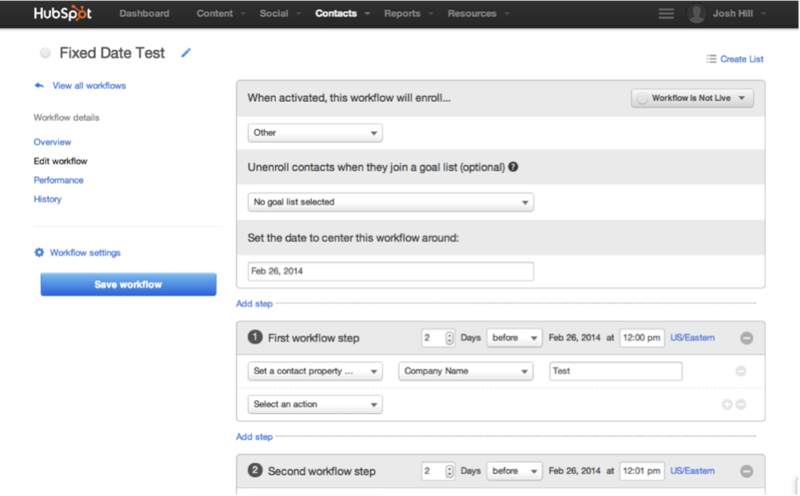 HubSpot also displays any lists or workflows the contact is a member of. HubSpot emphasizes the social aspect of the selling process thus it includes headshots (if it can match an email to a social profile) and the recent conversations, if any. This is an interesting view, but limits the marketer to HubSpot’s method. 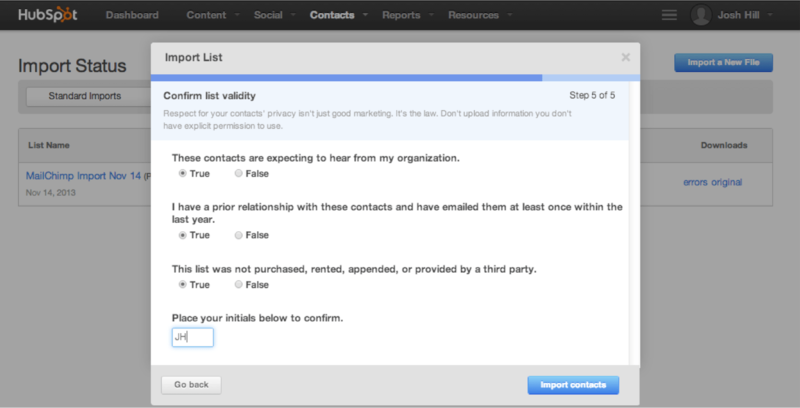 Many marketing teams need a spreadsheet view of the selected contacts to sort, filter, and export. Salespeople will find the personal aspects of a Contact view more helpful. From here you can select a lead to examine in detail. HubSpot is designed to naturally move your leads through a lifecycle. Individual records clearly display their current status. 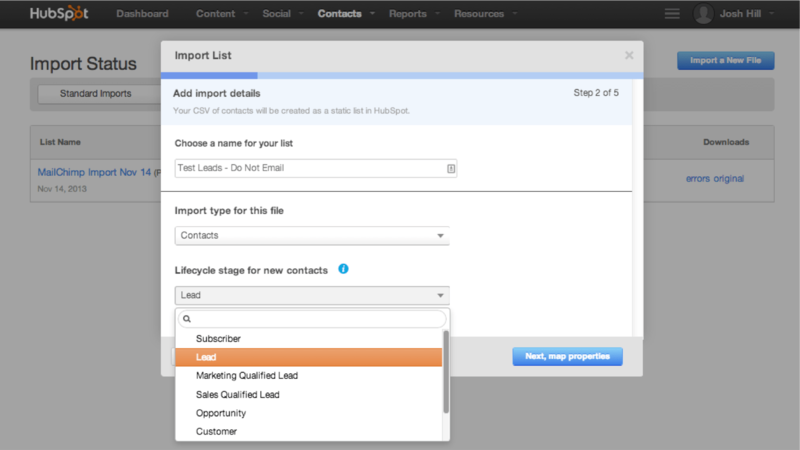 HubSpot uses the standard labels, although you can modify workflows that move leads between stages. The Anonymous Stage is not visible like it is in Marketo. Instead, you can see anonymous “Prospects” on the Prospect Report, which displays the reverse IP lookup. This is similar to Marketo’s Company Web Report – in HubSpot, this is the Contacts > Prospects report. To me the name is a bit confusing. You see a great list of potential prospects who have visited the site without filling out a form. Like all Anonymous reports, this will only show you ISPs and companies with reverse IP lookup. If one of those anonymous prospects provides an email address, then their activity is associated to that email, just like in Marketo. While the Stages are non-negotiable in a standard setup, you could create a custom Lifecycle Stage. I recommend using the standard lifecycle stages first. To use these, you do need to setup a Workflow with the triggers that define the transitions between Stages. In this sense, Marketo and HubSpot are similar. I am unable to show you a cool funnel report by Stage because I never set it up to do this. It does work and you can do it without fancy add-ons. Lead scoring is also available, although I found it was hidden in the Contact Settings area, rather than a central workflow feature. The setup is similar to most systems, using a set of criteria to identify matching contacts and then a Rule to adjust the score. The Rule Value is a little easier than Marketo in that it explicitly says “Add” or “Deduct” instead of requiring “=100” or “+5” in the flow step. As you know I prefer to weight behaviors and use demographics as filters. HubSpot has several automatic blog subscription options if you are using their blog system. This allows the user to throttle content. If you want to offer a Subscription Management Center then you will need to add the fields to the system and then create a Landing Page and Form. That’s one way at least. 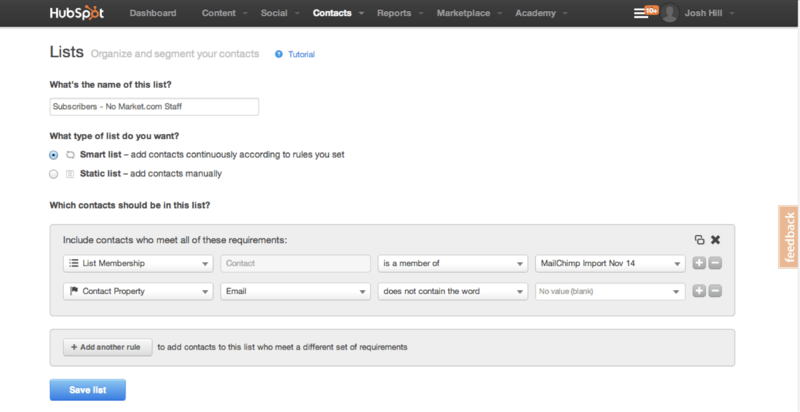 HubSpot recommends creating Email Types, which will help you easily, create communication preferences on the main Unsubscribe Page. Each email that you send must have a Type in order for this to work. I like this option because for less experienced users, it is easy to setup and move forward. More experienced marketing automation teams will want the flexibility available with fields, pages, and forms. In Marketo, subscription management is a custom affair. Each marketer needs to know which email templates to use and have the right links in place. For the first time HubSpot user, the Email Types enforces communication preferences without much thought from the user later on. Marketo lacks a “blog feature” because it is focused on lead management. With the acquisition of Insightera, expect more customized content on Marketo user sites. 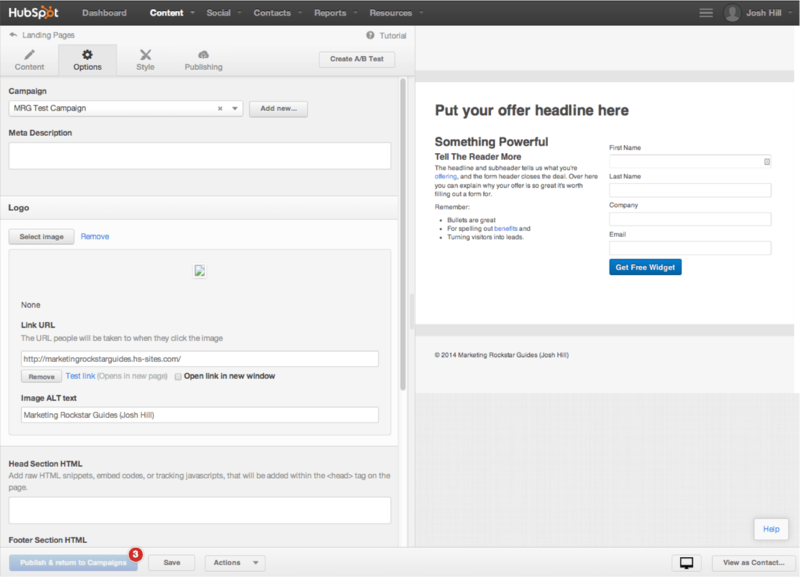 HubSpot’s integrated blog and blog email tool permits customized content for the emails that go to blog subscribers. I didn’t test this feature, however, I am confident it works well given the other content cstuomization tools HubSpot has. It is worth noting that my company’s latest product, Digesto is an RSS-to-Email tool for Marketo that does enable customized emails for blog feeds. 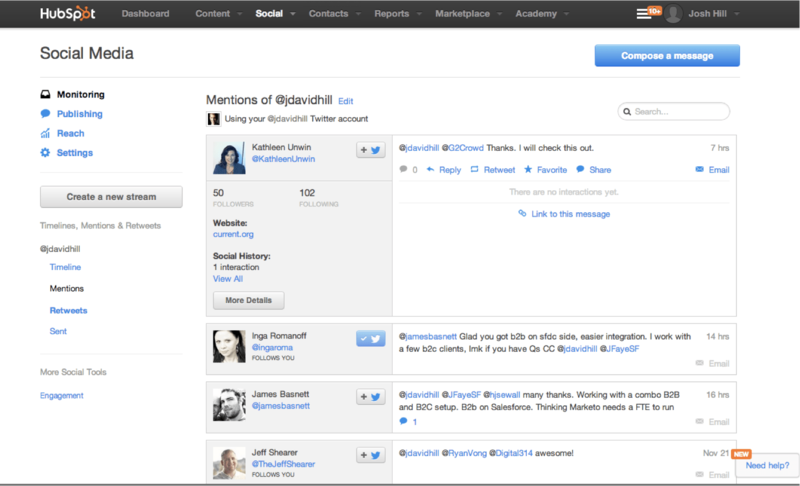 The clean UI is one of HubSpot’s best features. It has minimal clutter, helpful hints (most of the time), and a menu. The buttons and drop downs are in the latest “friendly” style that makes me confident the action is being done. There are some drawbacks and conceptual differences between this and other systems I have used. The Menu System is organized in a way that might be confusing to some users. 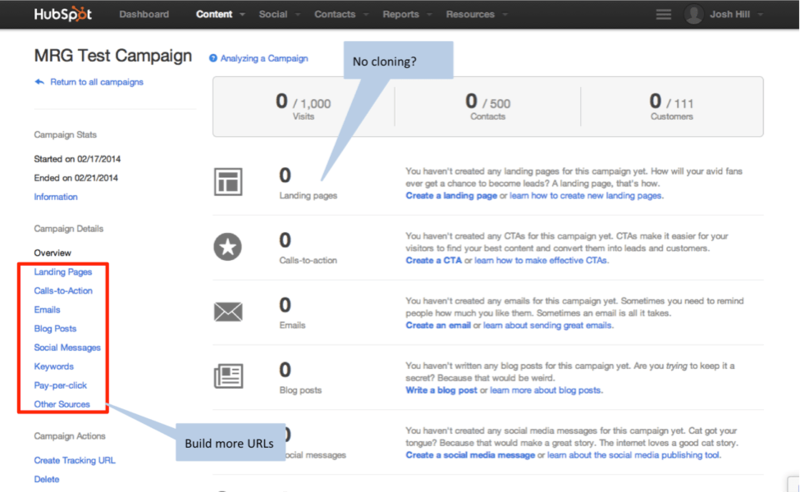 For example, Content includes “Campaigns” while you can access a Campaign’s components in Content, Social, and Contacts. Content menu contains pieces of even the pages, such as “Calls to Action” and Site Pages. The menu structure is about features than “What do I want to do?” A possible way to make this better is to take a cue from Marketo: Marketing Activities, Design Studio, Database, Analytics. In HubSpot, this could be setup as Marketing Programs, Content, Social, Reports, and Workflows. Workflows. (Rules) I believe getting this right is one of the big challenges any Marketing Automation Platform (MAP) faces. Eloqua uses Visio-like flow charts, Marketo does a four-part Smart Campaign, and HubSpot has Rules. None of these solutions are hard to learn, but I suspect some marketers may find one or the other easier to figure out visually. List Interface. For Lists, the basic criteria system makes sense with a set of Rules and Criteria. It’s not always clear how to create an OR between Rules or even within a Rule. I would feel uncomfortable dropping in a list of domains using copy-paste. In Marketo, this is very easy as there is a clear box for depositing lists into a filter. HubSpot began life as a tool to help marketers display and optimize content for search engines. This is still its key strength – tracking content use and leads. 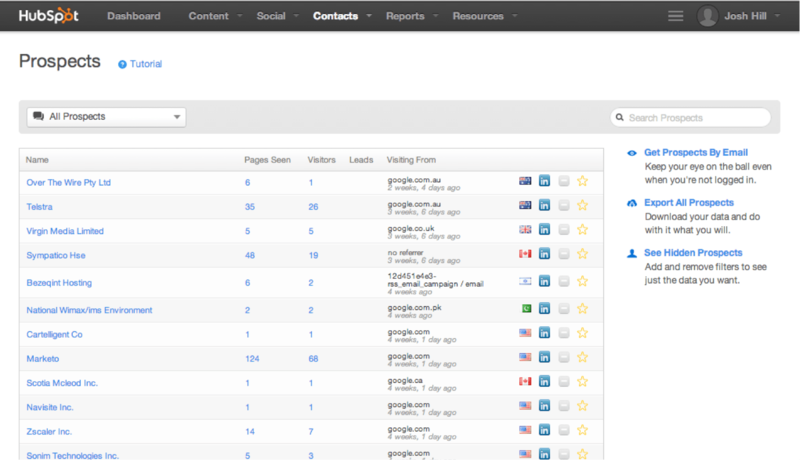 To this end, HubSpot tracks visitors to your site along with keywords and competitive SEO data. To me, this is a feature that is lacking in Marketo – the TOFU reporting and funnel tracking. You can do this in Marketo, but it is much harder. While I was unable to test this aspect of Marketo, PPC is definitely a component and there are several URL parameter options to help track this in addition to the standard reports. 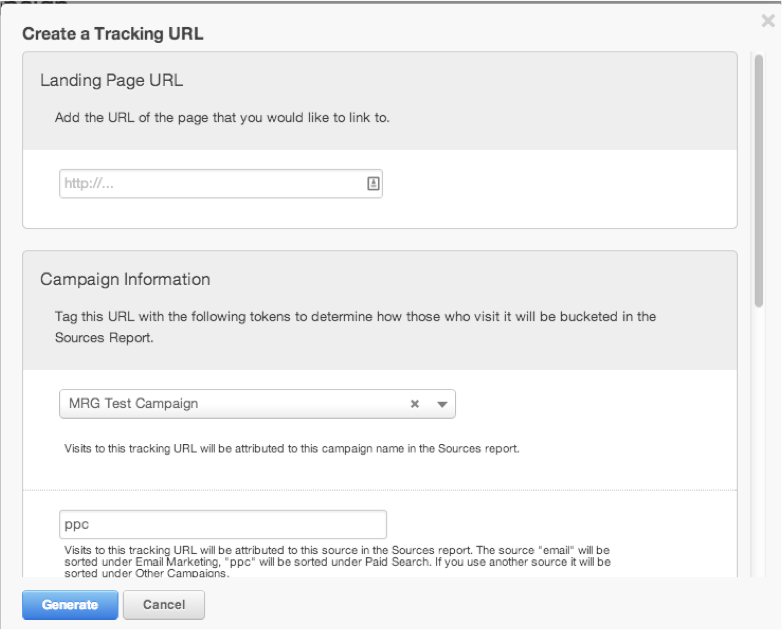 HubSpot does a pretty good job of auto tagging Sources and allows you to go further with URL parameters of your choosing. Before this trial, I had the impression HubSpot was more deeply integrated with AdWords, however, this can done via Marketplace tools. Monitoring – uses the stream dialog and allows you to interact under several profiles. You can choose or create Streams to monitor. Segment monitoring – know what your MQLs and Lost Opps are saying about you. Contact monitoring – you can see the social activity of a lead on the lead record. Published – watch what you Published. Scheduled – just like in HootSuite! Timeline – social events appear on the Contact’s timeline and is available to use for triggers and segmentation. Twitter activity – number of tweets, etc. The Contact detail will also show the lead’s picture and social details if HubSpot matches their email address to social profiles. We can learn about our Reach as well. Nurturing leads is something that every MAP claims to do in some fashion. HubSpot has had this feature for some time, although I wasn’t aware of this aspect until after they relaunched it in 2012. Of course, Marketo and Eloqua made this a central theme of their system and external marketing. I did not get a chance to explore HubSpot’s implementation in great detail. HubSpot staffers have created a few “Recipes” that are available to import into your HubSpot instance (very much like Import Programs in Marketo). Most of the recipes are related to drip nurturing. Drip campaigns are done with Rules that can run on their own or as part of a Campaign. I was considering how to replicate the Marketo Traffic Cop system in HubSpot, because it is clear there is not an “Engagement Program” available. After speaking with Rick and his team, they thought it was possible to do so with Workflows and Campaigns. I agree it’s possible and probably just as much of a pain to setup as it was in Marketo. So if a drag and drop lead nurturing system is important to you, HubSpot may not be a good choice today. In 2013, HubSpot launched its Content Optimization System (COS) to much fanfare at the Inbound Conference (I was there, and people LOVED IT). In fact, I loved it too. The COS goes beyond HubSpot’s blog tool and lets you develop a dynamic website based on existing smart lists and the content you create for each audience. Multiple blogs are available as well as page development tools. The COS is closer to WordPress meets marketing automation than competitors would like to admit. Marketo continues to add to its ability to offer up customized content with Dynamic Content and the new Insightera acquisition. 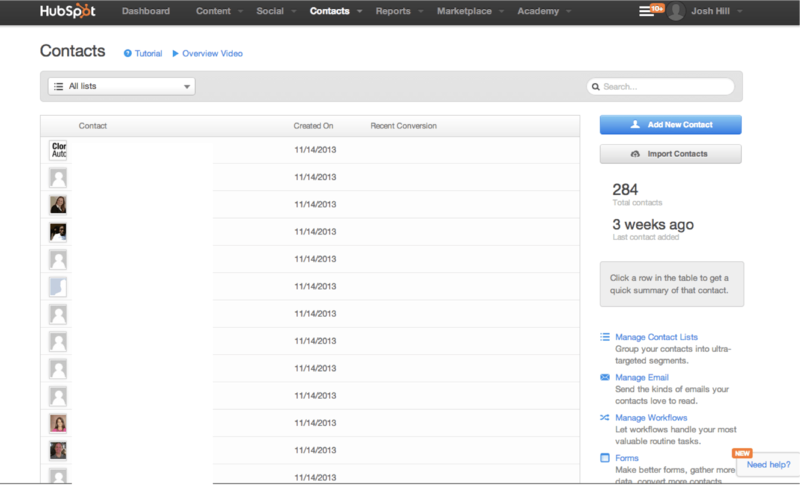 Yet HubSpot’s COS seems more integrated with the base package and much simpler to use. Take a look at a more detailed review of the COS.
Once the domain of high-end systems, MAPs offer the hands-on marketer the ability to create one email or page and have it tailor the content automatically based on demographic or behavior criteria. The setup of such a system can be complex, creating thousands of variations on even 5 or 6 segments. HubSpot successfully helps the marketer create a dynamic email or landing page with very little effort. The principles may be the same, but HubSpot seems to make it feel easier. The Marketo Dynamic Content option relies on Segmentations, pre-filled target segments such as Region (Americas, Asia, EMEA) or Behavior (Clicked, Opened, etc). These are created in advance and then the marketer must go into the content. In a piece of content, each section receives several variations, each for a specific segment. The advantage of this system can be lower demand on processing time as well as a nice tree system designating content for each Segment in specific groups. Marketo limits the number of Segmentations to 20 with 100 sub-segments each. 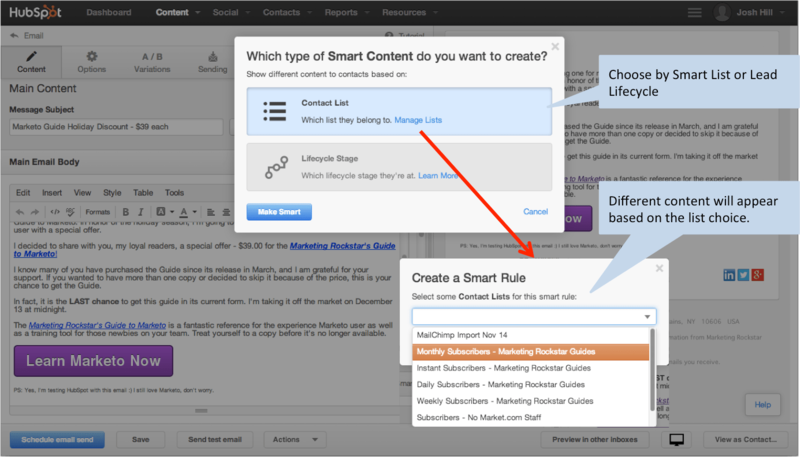 HubSpot uses existing Smart Lists, with no limits that I saw. The challenge with HubSpot is the content must be copied and pasted into each Smart Content area and then you adjust the text. Not a huge deal, but it could be if you are doing a dozen variations. I enjoyed the easy selection and manipulation of content. HubSpot’s achievement is to make this process in line as you create the content. With each variation, you select the smart list that will see that variation. There is no need to build a separate and static list system. In addition, HubSpot makes it clear where the variations are. In Marketo, this step requires some knowledge of the system. One point I know some Marketo users will make, is that Dynamic Content on assets is better in Marketo because you can choose the elements and they appear in a tree format for easy manipulation. I agree that’s pretty awesome for very complex setups. I felt HubSpot’s system felt more natural for people with less experience who are attempting to create a few variations. 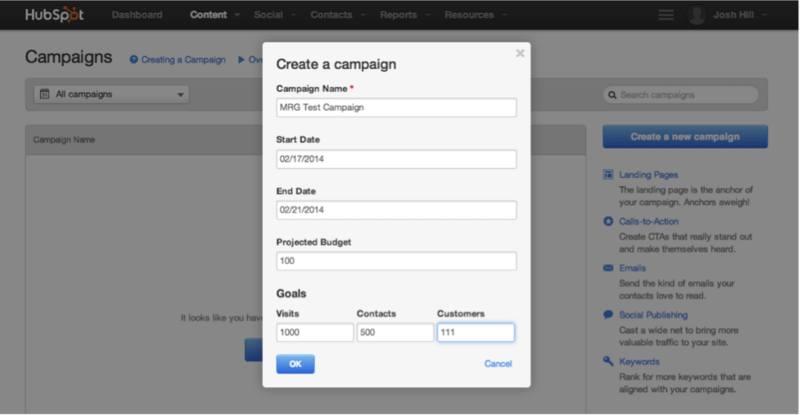 HubSpot uses a system called “Campaigns” instead of the Marketo Program. Functionally, the concepts are the same, except that the visual tree display Marketo uses to show things like results, emails, pages, forms, and workflows are not there in Marketo. Instead, you create the needed components. HubSpot Campaigns do offer more integrated TOFU options via COS, SEO, and integrated URL Parameter building. The Campaign system allows you to create content within the Campaign that is attached to that Campaign system. You can also bring in other content by changing the asset’s affiliation to the Campaign you want. You can clone an asset and then associate it to a new Campaign. Assets cannot be associated with more than one Campaign at a time. But you can easily switch an Asset’s affiliation if a Campaign is over. A Campaign can include multiple assets of the same type. Rick tells me that assets are tagged by Campaign and would show up there, although I have not seen this anywhere other than the help area. Once inside, you see the Campaign dashboard. Coming from Marketo’s tree based organization view, I did not find the HubSpot Campaign system easy to grasp. The dashboard is nice, but I want to see at a glance how my system is arranged. I want to click on the asset directly and not have to go through several pages to look at each component. 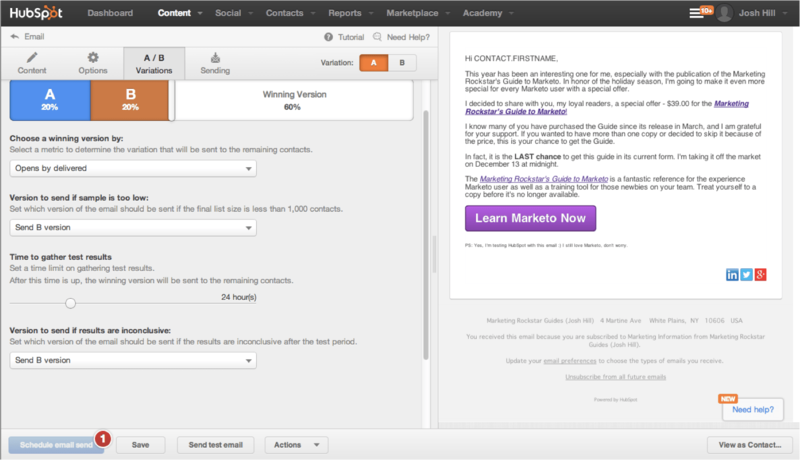 If HubSpot can take that step past Marketo Programs, their Campaign system could be more impressive. I did not try to build an entire system, however, you can see from the screenshots that this is a multi-channel system with unusual options. The system seeks to integrate content of all types into the single campaign. A common refrain in Marketo is “How do I track multiple sources for a single Program?” HubSpot just walks you through all that, even though both systems rely on URL parameters. 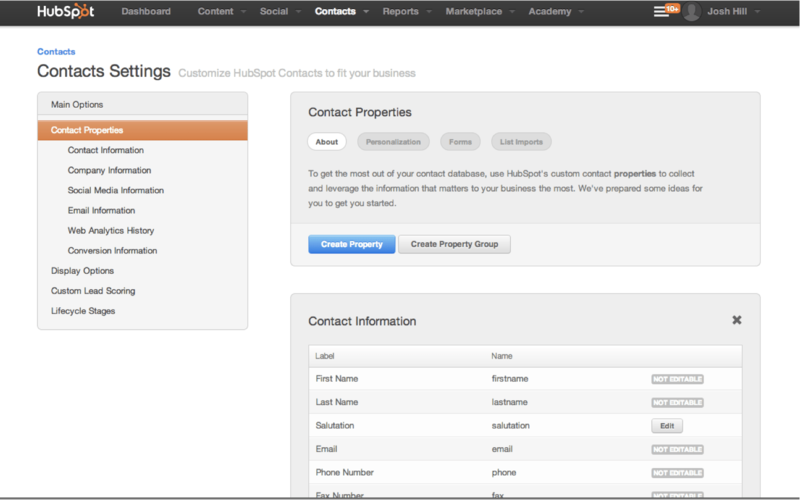 In HubSpot you don’t have to set it up entirely by hand or with hidden fields – just add some names and it just works. Workflow settings are similar to the Schedule options (Qualification Rules) in Marketo. The neat thing is HubSpot provides these on a clear “Settings” tab, permitting the rule to run within time frames and to control Suppression and exit-entry. Using these settings creatively, you could build a Traffic Cop system for nurturing. Perhaps this would even be easier than in Marketo since you won’t need separate Entry-Exit workflows – it’s all self contained. Reporting on a campaign is excellent. 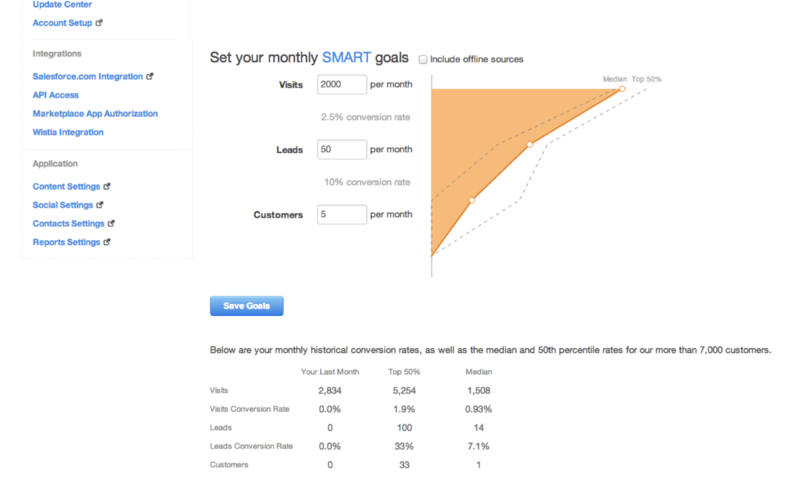 You can set budgets and targets with SMART goals. If you’ve set it up correctly, you can easily see visits of content across the campaign along with a clear funnel. I did not spend much time with this section because of limitations for the site integration. I can say the landing page creator is similar to the Email asset creator, with similar AB testing options, and an instant previewer. HubSpot has taken care to walk the user through the necessary SEO setup as well, instead of hiding this as Marketo does. Password protected pages. – Very cool. Choice of main domain or HB hosted. Improved table insertion in html. Emails are a central component to any MAP. 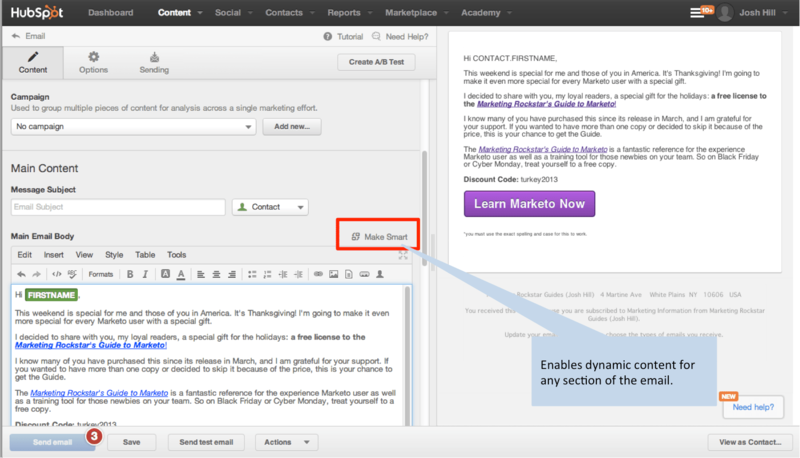 HubSpot has a pretty good system for creating and sending emails as one offs, or as part of a Campaign. Unfortunately once an email is used, it has to be cloned to be added to a new send or a new Campaign. 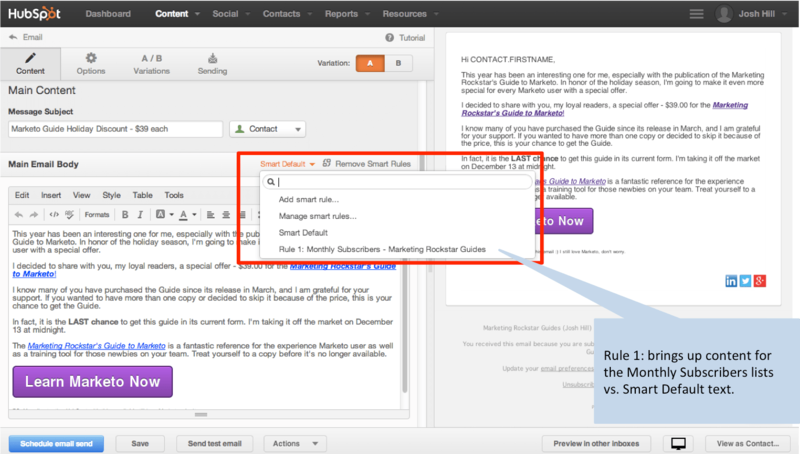 In other MAPs, the email is usually independent of a list or a “send action.” In HubSpot, the smart list is a main component of the email creation process. You can choose a specific list and a specific block list at the same time. Again, this is a bit different than other MAPs that allow you to use Boolean operators and list combinations. For the mid-market that HubSpot targets, this simpler setup likely reduces the chances of a mis-send. HubSpot does allow you to create a basic html email very quickly and with fewer clicks than a Marketo email in my experience. You have the option to create a text email. I was surprised HubSpot didn’t encourage this as it is part of email deliverability best practices. AB testing is embedded into each email, which is a bit different than most systems. You can modify the sample size and the winning statistic (Opens or Clicks). The selection interface is clear and takes you through the setup with ease. The difficulty is that HubSpot does not warn you if your list will be too small for a statistically significant winner to be chosen automatically. HubSpot does not tell me the exact statistical confidence level, which might be nice to tinker with. This oversight was a big disappointment for me. As you can see here, I only found out after the email went out. Initially, it did seem that the email went out twice to the same group, but now it appears that it only sent the default variant B to 278 people. The way in which this was reported at the time did make it seem that it had sent out 600 emails instead. At the same time, I did enjoy the interface. It shows me a preview of the email while I write it. There are clear spaces for the header information and other options. HubSpot is good at forcing the marketer to create a clear CTA complete with a CTA button generator in the color of your choice. In March, HubSpot began offering Litmus driven email testing, bringing a marketer’s game to a whole new level. I’ve been a fan of Litmus for a long time and am delighted that this tool is a click away for live email previewing and testing. Mailchimp offers a similar service for its paid clients, and yet, Marketo makes email deliverability an add-on, while HubSpot includes Litmus on all pricing tiers. 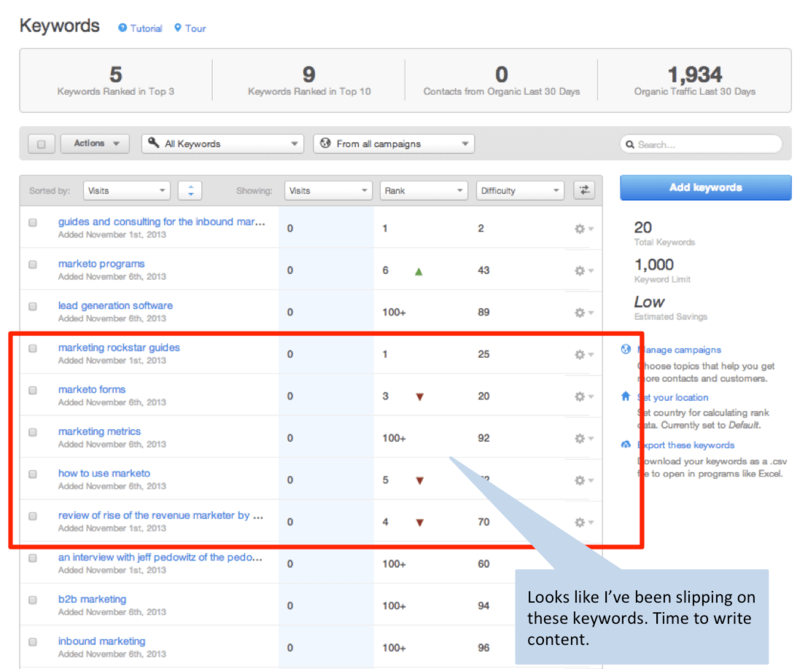 In my opinion, HubSpot nailed the reporting function for TOFU and to some degree the entire funnel. The lack of easy to pull time series reports and charts is still hurting other MAPs. Meanwhile, it’s been part of HubSpot all along. 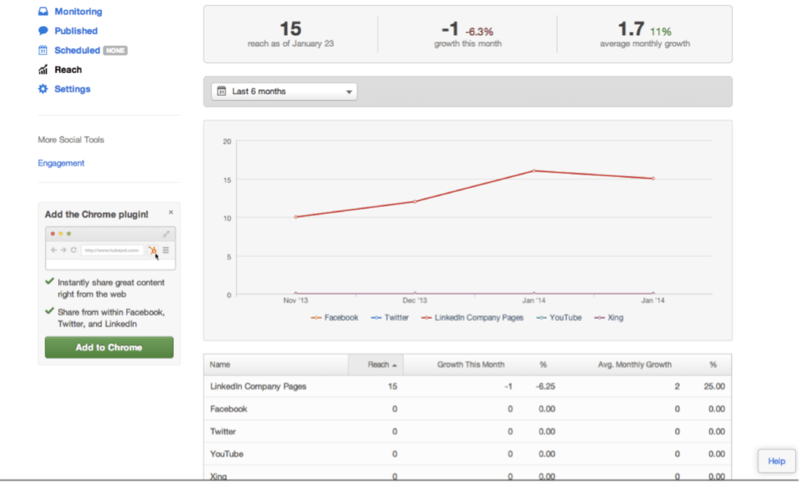 Marketing Performance Dashboard – when I login, I see this chart with a Month over Month comparison of my funnel. This is easy to modify. 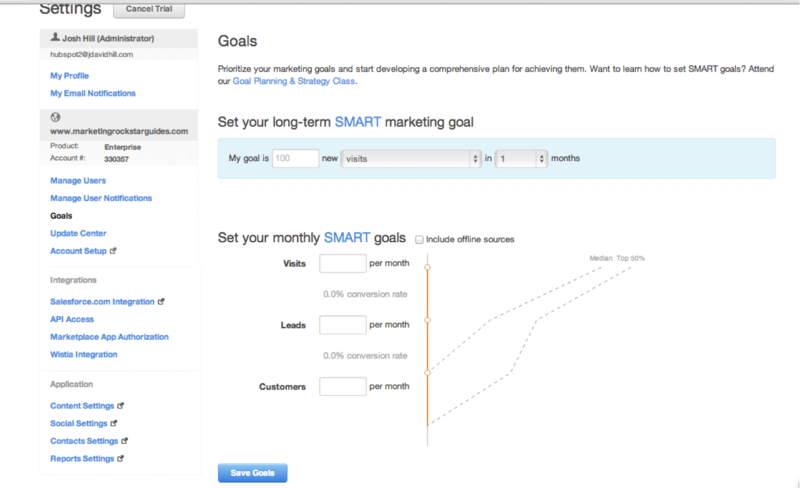 SMART Goals – HubSpot embraced this methodology and promotes it on their blog and within the system. This is a neat tool that let’s you choose a target and see how well you perform automatically. 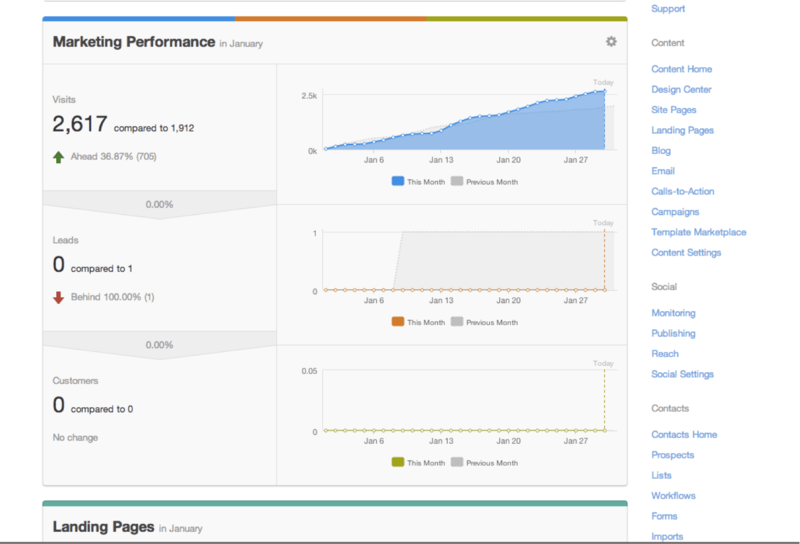 This same page shows your conversion statistics benchmarked against HubSpot’s customers. Very cool, now I get my goals directly connected to my lead count. No more spreadsheets (or so I like to think). HubSpot has a free tool that lets you do the same thing. Monthly Summary Reports are emailed directly to you in PPT for easy conversations with your team and managers. This summary too has been reviewed elsewhere and it truly is a great feature that saves time. To get Monthly Summaries, you need to turn on Email notifications. If you’re anything like me, you might have turned them all off to start. Then HB sends you this helpful email with a PPT attachment that you can just forward on to your boss. Now, reporting in HubSpot is not going to provide pivot table breakdowns or anything similar to Marketo’s Revenue Cycle Analytics. What HubSpot does provide feels superior to many other MAPs out of the box, which is great for mid-market. Most organizations I have come across don’t need more sophistication than this for the first year of MAP operation. I was unable to personally call Support or use the Chat options. You can check other reviews. I have seen their call center and it looks professional and fully staffed, so if you are on a trial, give it a try. The online documentation is easy to access from “?” icons and the Help button in the lower right corner. Live help is available in the lower right corner with Chat, Call Me Back, and Email Me Back as options. The User Guide documents were helpful for individual features and use cases. Most had good screenshots that walked through the setup. There are shorter Quick documents that have less detail. Users can vote on the helpfulness of the content using a star system. There is also a feedback link at the bottom of the page. This is in contrast to Marketo’s Community where a text box is right on the page. I also noticed most articles opened up in a new tab. That’s helpful sometimes but not always. Speaking of which, nearly every page on the Knowledgebase opened in a new tab. I could see that being helpful, but I found it annoying. HubSpot has a thriving Marketplace with add-ons, templates, and more for sale. In some ways it feels more active than Marketo’s Launchpoint. They even launched a native GoToWebinar integration, and you can get other third-party tools easily. 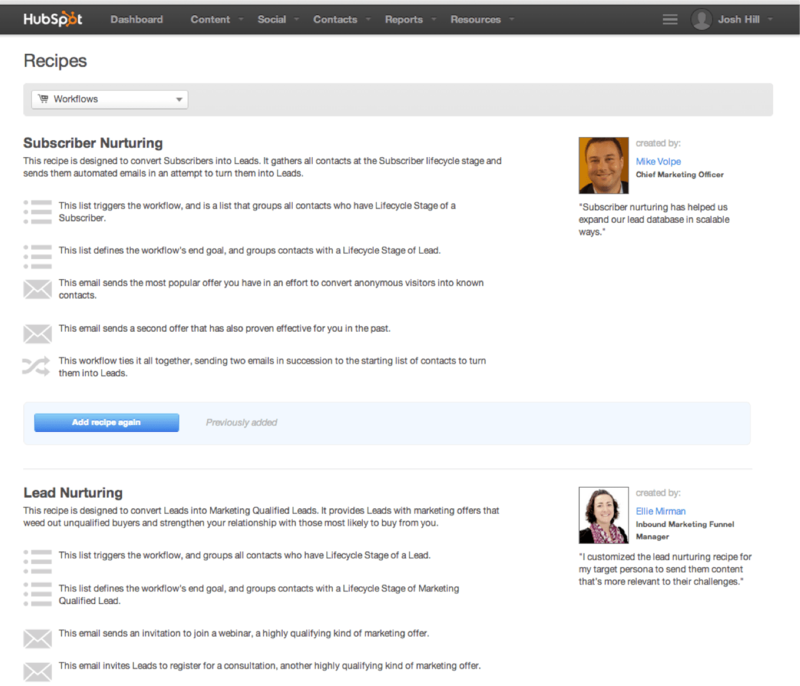 I especially like the “recipe books” that allow you to bring in others’ previously tested systems, including HubSpot’s. Marketo also has a similar service with Import Program and Templates.Marketo.com. If you are thinking of adding a certification to your resume, you will need to be a HubSpot customer. The HubSpot Inbound Marketer certification is open to everyone, although I haven’t seen anything on how well this works for careers. Marketo’s certification program isn’t necessarily restricted to clients or partners, but passing typically requires about 6-12 months of experience in the system. I do recommend the following certifications, as more and more employers require it. HubSpot Inbound Marketer – good for early career or switching so people know you understand the principles. Marketo Certified Expert – you may find my Marketo User Guide helpful. HubSpot Certification – good if you are using it now. Since I come from B2B demand generation, I still tend to think in terms of various marketing activities and channels: events, tradeshows, ads, email promos, etc. You can do all of this in Marketo and HubSpot. Marketo was designed to align with the B2B demand gen way of life, while HubSpot was designed for inbound (TOFU). That is not to say you can’t run an event via HubSpot – of course you can, it just won’t be set up in the same way. For us older Marketo users, HubSpot is exactly where Marketo was pre-Programs. In that sense, Marketo is a “demand generation operating system,” while HubSpot is more of a TOFU/inbound system with automation tools. I bet HubSpot makes me change my mind in the next 15 months. Completeness of Vision _ TOFU, yes Demand Generation Operating System? No. Lead management No Yes, you can do it. Not clear and easy. Help – Easy to use Some UI issues, didn’t feel complete. User Interface Yes Clean, friendly A few misses on more complicated areas. Pricing No On par with major MAPs Expensive if you try to match Marketo, Eloqua in options. Lead Nurturing No Drip Only Needs development. Dynamic Content Yes Integrated into system and workflow. A little harder to setup for large variations. Content Operating System Yes Integrated content into system Doesn’t help if you have a website you intend to keep. Email AB Testing Yes Easy to use; statistical limits. Add more statistical tools or help. Campaign Creation No This works for multi channel programs. I found this confusing coming from Marketo. Certification – HubSpot University Need HB to obtain. Lead Scoring No Works just fine. Seemed less flexible. Funnel Reporting – TOFU great, BOFU pretty good. Not as customizable. Multi touch Attribution – Marketo clearly wins here when you have Revenue Cycle Analytics added on and setup properly. I feel that HubSpot is aiming for the Enterprise, although they focus on the mid-market. I know of several enterprise firms that have used HubSpot now and at various points—even a couple that had both HubSpot and Marketo. While they already have a few enterprise customers and firms with large databases, the system doesn’t feel completely fleshed out yet as a demand generation tool. Each feature feels independently developed, for example with Campaigns built on top of Workflows and Assets. Marketo did this too, but it feels more integrated. There are database limitations that would not benefit certain large clients, especially ones with existing and sophisticated lead flows and nurturing. Can it be done with HubSpot? Yes. Will it be easy or obvious? Not so much. In terms of pricing, HubSpot is not cheap and most firms have enough leads and email activity to be placed in a higher tier than they would like. HubSpot does seem like a better deal than Pardot’s latest pricing. Going for a higher price indicates a vision for high quality service and to be seen as a serious contender for enterprise in the future. HubSpot tells me that they do scale well for the enterprise and their reliance on Hbase and Hadoop is in fact far better than other tools, which still rely on relational databases. That’s hard for me to dispute, so I won’t ;). To me, technical scale is a bit different than scaling the interface for twenty marketers running global and regional programs. I continue to believe Marketo is the best marketing automation tool for its purpose. The same can be said for HubSpot. If your firm fits into the mid-market, HubSpot is an ideal system for getting going in the world of marketing automation and content driven marketing. If I could take the best of Marketo and Hubspot and place them into a new system, I would do that. A cleaner UI with powerful workflow and database tools along with true social monitoring, data collection, and SEO? That would be awesome. 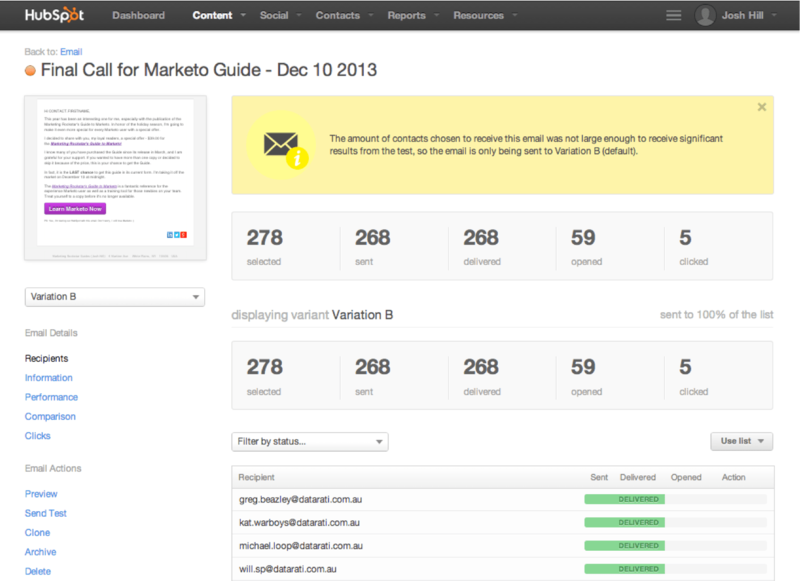 Keep an eye for new features from HubSpot and Marketo. 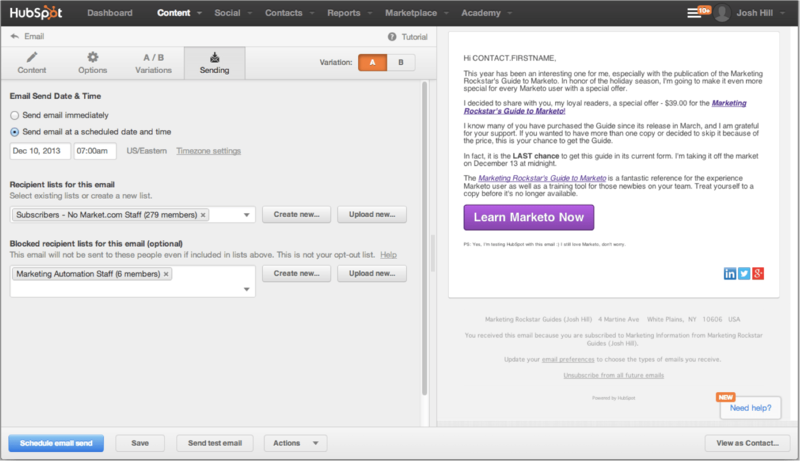 During my evaluation time, HubSpot has put out some great new features and is beta testing others. Marketo is releasing major new upgrades in May with the Marketing Calendar and the long awaited SEO/SEM tool. Email AB Testing embedded into workflow along with statistical validity. Button Creation via the “CTA Builder” and re-usable buttons. Database Management lacks typical tools and views. Workflow Management not conducive to complicated nurturing. Seems to have less flexibility when it comes to creating types of Emails. Once an email is used, you have to Clone it to use it again. User Interface not action oriented. I was unable to verify these features due to time and technical constraints. If your team is focused on PPC and SEO and is part of a smallish firm, HubSpot is probably your best bet. If you are part of a larger firm with a fairly large database (over 30,000), and you are preparing to ramp up nurturing and lead lifecycle, then Marketo is more likely to help you. As I tell everyone on Twitter, it’s about what you need more than “which one is better?” Which one is better for you? I came across other reviews of HubSpot which may help you. Top 10 MAPs: HubSpot ranks #1, Marketo #3, while recently acquired Silverpop ranks #10, below acquirer IBM. 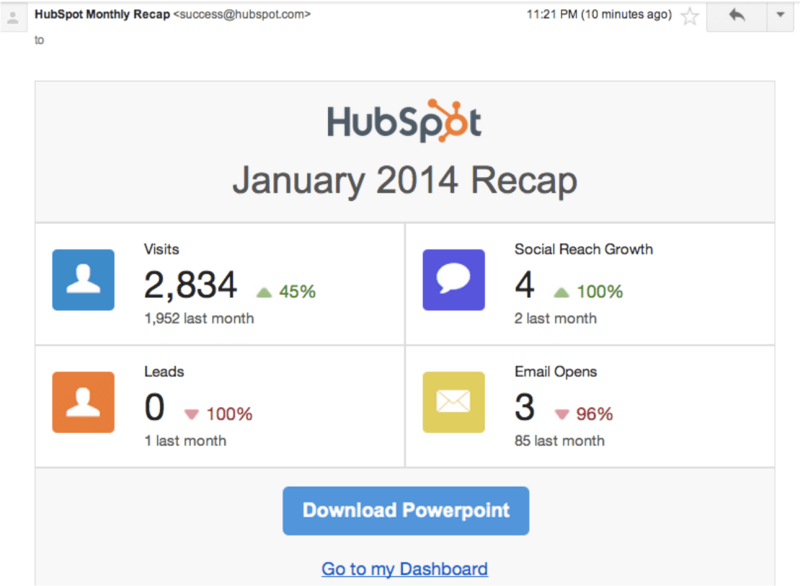 Have you used HubSpot? Tell us about your experience in the comments below. Disclosures: HubSpot has provided me with a full trial to the system for free and without consideration. I work at Perkuto, makers of Digesto. Great job. I’ve used both systems for clients, and I think you nailed the pros and cons of Hubspot versus Marketo. I love their UI – very easy, but like you had a hard time finding things in the navigation. “Events” was especially hard to find. I found dynamic content easy to use. 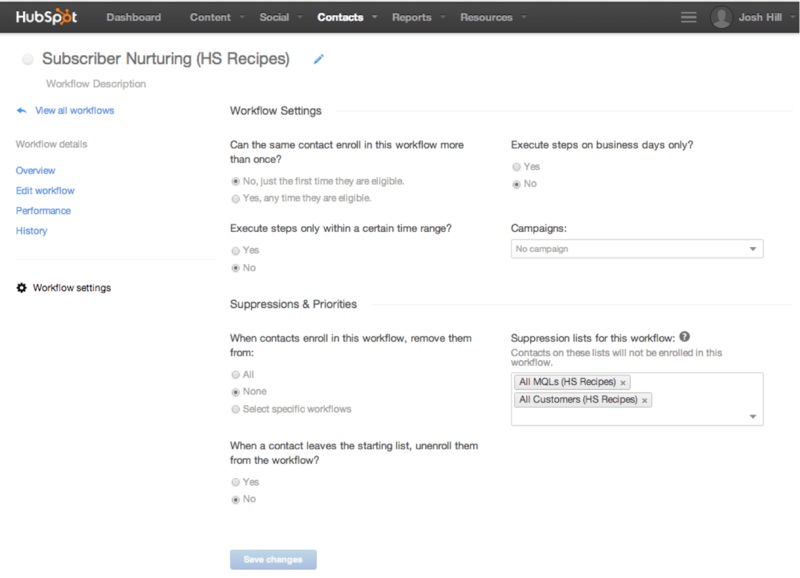 For simple nurture flows and low to medium scrutiny products, Hubspot is fine. Having to build a program (workflow) for a product that requires more buying process stages is possible with Hubspot, but not as easily done as with Marketo. I agree with you on their demand gen limitations. It really is built for inbound marketing, so building an outbound campaign was possible, but severely limited. This is mostly because workflows are designed to be a very simple “drip”. That works when someone has already expressed interest, but if you’re trying to get their attention you’re actually better off using Mailchimp. Thanks for this. I’m sure Hubspot will continue to grow, but their basic philosophy (from the Hubspot reps I’ve spoken with) is that marketers are basically dumb and will get easily confused if they try to make campaigns complex. Thanks for your comment and additional insight on the two systems. HubSpot has been very good at educating marketers on the new reality (they helped me a lot) and their system reflects much of that education. Marketo has also taught us all a ton about MOFU. Excellent review. Very detailed. It’s good to see depth of information versus some of the fluff we often see in “reviews” that re-hash positioning statements. The only problem I have is how Hubspot is often compared to other platforms like Marketo and Eloqua. To me they are positioned for totally different markets. (I’m a former Hubspot customer from several years ago.) I know Hubspot is trying to climb the ladder upstream to midmarket and even some enterprise customers. The one area I have struggled with Hubspot is their analytics. If you used their platform for your blogging engine and even web site hosting, it’s great. But if you are only using for analytics and inbound/outbound with an existing site and blog, the analytics were always way off from what we saw from the CMS and Google Analytics. Hopefully that’s been reconciled now. Thanks again for the excellent review! Thanks for sharing your experiences. I agree Marketo and HubSpot not quite positioned against each other, but people on social are comparing them directly. HB’s pricing and messaging is going upmarket now, so we’ll see how the system changes to reflect that. Hey Josh, great, detailed review! If you ever feel called to review another TOFU-heavy MA application, one that integrates with Mailchimp and WordPress, and has a lower price point intended for smaller businesses and agencies – I’d be happy to give you a Spokal account for testing/review purposes. I’d be happy to check it out. Email directly. I know it is not a good question to ask, but still curious to know. Can I not buy marketing lists from vendors and import it to do outbound cold email marketing in Marketing Automation Platforms like Marketo or Hubspot both? Sure, you can do this. Do I recommend it? No. The reason is it is rare that the email addresses you obtain are opted in to receive your communications. They are likely opt out lists which may or may not violate local rules (check with attorney). WHen you do this, it is very likely those emails are bad or will unsubscribe, lowering your reputation. As long as you do not email that list, it’s ok to load. Thanks for the in-depth review – I’m working on my first HubSpot project and this article has helped me save a lot of time figuring out some of the things I’ve got to learn. You said you use Mailchimp for your own efforts. I’m in a similar spot – I work with Silverpop but don’t want to spend $$$ for having my own instance. I use Active Campaign, instead – have you used it before? It’s super affordable and feature rich – a much better option that Mailchimp (at least for me). Glad it was helpful! Can’t say I’ve heard of Active Campaign.